What would you campaign for? I have been fascinated this month by the TV and Radio 4 coverage of the centenary of the death of an amazing Geordie woman and suffragette, Emily Davison. Being a Geordie myself and something of a campaigner in my time, I can identify with the strength of feeling she had for her cause. Her cause was women’s rights. As part of my research for the WW1 play we will be doing next year in conjunction with the Everyman Theatre, I have been studying Emily Davison. Emily was born in 1872 and was from a respectable Northumberland family. She was intelligent and well educated, going up to Oxford University and gaining a first class honours. However she could not graduate as degrees were closed to women. The unfairness of this would not have escaped her. She went on to study foreign languages before leaving to become a governess, then a teacher, after her father died leaving her mother unable to further fund Emily’s course. But it was women’s suffrage that was her raison d’etre. Emily progressed from disrupting meetings to stone throwing and arson. She was arrested and imprisoned for various offences nine times. 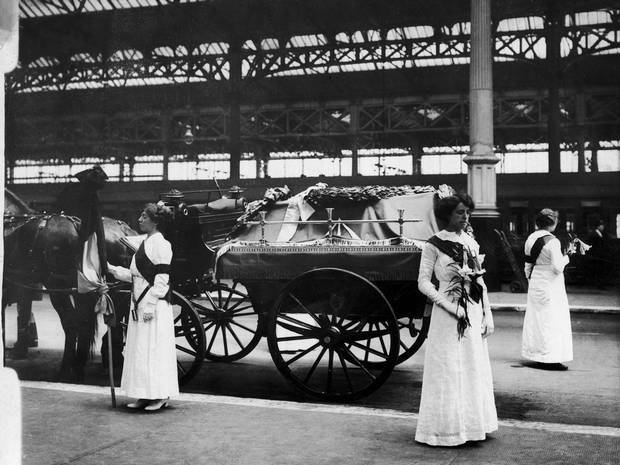 In 1909 Emily was sentenced to a month’s hard labour for throwing rocks at the chancellor’s carriage. On 2 April 1911 she was found “hiding in the crypt in the Houses of Parliament”. She was actually in a cupboard in St Mary Undercroft, which is the chapel for the Palace of Westminster. It was the night of the census and she wanted to put ‘House of Commons’ as her official residence. I am awed by her cunning and courage, as was Tony Benn MP, who had a plaque about this event placed in the House in 1999, albeit in a broom cupboard! 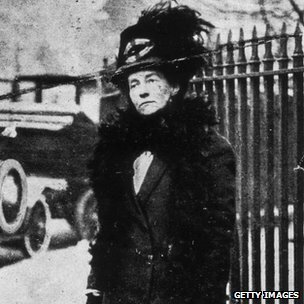 In 1912 she was sentenced to six months in Holloway Prison for setting fire to a pillar box. While in prison she was force-fed after going on hunger strike. This was a barbaric act akin to torture. Indeed in the Houses of Parliament, the labour MP George Lansbury said the Prime Minister HH Asquith would go down in history as being, “the man who tortured women”. On 4 June 2013 Emily took a risk too far when she tried to disrupt the Derby at Epsom, a famous horse race and British institution. It was assumed for a long time that she had wanted to commit suicide when she ran onto the track in front of the King’s horse, Anmer. However scholars, forensic scientists and others have examined evidence in recent years and have concluded that she probably just wanted to make a spectacular gesture by holding up her suffragette scarf and maybe putting it on the King’s horse, to draw attention to the cause. Finally in 1914, the year the world was plunged into a dreadful war, Prime Minister Asquith made a commitment to giving women the vote after the war. In 1918 the Representation of the People Act granted women over the age of 30 the right to vote, as long as they were married to, or a member of, Local Government Register. It also extended men’s suffrage to the right for all men to vote over the age of 21, and abolished most property qualifications for men. In 1928 women were granted equal suffrage with men as they could vote at the age of 21 and most of the property rules were abolished. So Emily, along with the thousands of brave women in the suffragette movement, achieved her goal. Her courage and steadfastness is remembered and celebrated still a hundred years on. There is a wealth of documentary evidence and articles written about the Suffragettes and Emily Davison and I have added links for anyone who would like to know more. I have also attached a link to newsreel of both her death and her wonderful funeral for those who would like to see it. Being on the Public Affairs Committee in the Women’s Institute is my own way of making a difference in my own community and the world at large these days. The WI campaigns on many issues and is well respected for their achievements. The following article asks “what would suffragettes get off their backsides for today?” Do read it. This entry was posted in Education, Musings, women. Bookmark the permalink. A very moving pace had me in tears. Oh sorry, don’t want to distress with my posts! But I could not let the centenary go past without marking it in some way. Thanks for reading.